Airbus DS Communications has launched a new solution within their VESTA® 9-1-1 portfolio — VESTA® Map Local. The new mapping platform was developed with Airbus DS Communications‘ technology partner GeoComm. This is one of the first mapping systems to integrate both RapidSOS location technology and the Esri® ArcGIS online maps. These capabilities help Public Safety Answering Points (PSAPs) improve location accuracy for indoor wireless calls and offer unprecedented user performance and map display speed. Plus, the VESTA Map Local solution integrates with the company’s leading VESTA 9-1-1 call handling system, saving PSAPs valuable seconds when they matter most. Today, 80 percent of 9-1-1 calls are made through a wireless device. Wireless calls often do not provide precise caller location quickly. 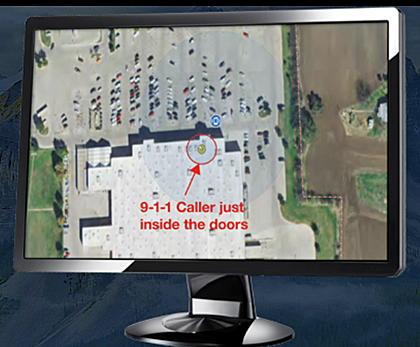 With the integration of the RapidSOS NG911 Clearinghouse, PSAPs now have the ability to pinpoint wireless callers’ locations more quickly and with greater accuracy. The technology transmits precise, device-based hybrid locations from smartphones directly to the VESTA 9-1-1 console by using all available sensors on modern smartphone devices — including GPS, WiFi Access Points, Bluetooth beacons, and barometric pressure sensors. The VESTA Map Local solution is also one of the first to use the innovative Esri® ArcGIS Runtime platform. With Esri, a leader in geographic information systems (GIS), and the ArcGIS online maps, VESTA Map Local users will be able to extend Telecommunicators’ views outside county lines, where no map or GIS data previously existed. This means that, whether a wireless call originates inside or outside of a county, 9-1-1 call takers will have contextual data — including streets or common points of interest such as lakes or streams – to help them locate callers. The Medina County Sherriff’s Office, a three position PSAP, located in Texas and The Collier County Sheriffs Office, a 36 position PSAP located in Florida, were beta partners for the VESTA Map Local solution. Both were eager to adopt the new technology to strengthen public safety communications for their communities. Medina County Sheriff, Randy Brown, stated that his department's call takers feel that the new mapping system is clearer and more precise when looking for a residence or key points. It's now easier to look up addresses as the quality of the county map has been enhanced. If a caller does not know their exact address or location, this new mapping system will update the location on the Calltakers' screens which decreases response times and provides a more accurate location.